Carrie welcomes the opportunity to share her passion for ‘greener living’ through talks in the community. She speaks on a variety of topics including climate change, recycling, inspirational upcycling, and her favourite charity – the Purple Community Fund - to name a few. She is keen to engage and share her climate change knowledge. Much of this was gained in March 2016 when Carrie went to Manila, in the Philippines, to train with Al Gore (the former US Vice President), who led a three day training programme for climate change scientists and climate change communicators. There were over 700 other passionate environmental communicators from 33 different countries on the programme. There are some 12,400 Climate Reality Leaders now trained worldwide, with over 150 in the UK and 5 in West Sussex. 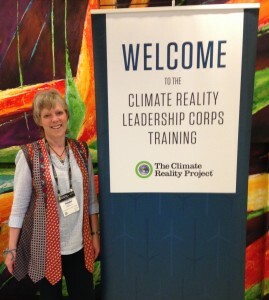 Carrie Cort, a multi award winning environmental communicator, is available to share Al Gore’s Climate Reality presentation with the people of Sussex and the surrounding counties. The aim of the presentation is to break down the complex terms of science and policy into the language of everyday life, so that people everywhere can understand how climate change directly affects them. They can then join the millions of people worldwide in making changes to their everyday lives which will make a real difference. There is information about the negative effects humans are having on the planet which sustains us, but Carrie quickly adds “the presentation also includes lots of statistics, evidence and reasons to be cheerful”. Al Gore’s Climate Reality presentation and reasons to be joyful! Climate change and its effects on the poor. The environmental effects of the fast fashion industry (link between climate change and fast fashion). What do nettles, eucalyptus and a t shirt have in common? (similar to the talk above but with more emphasis on sustainable and unsustainable textiles). Life on a dumpsite in Manila, Philippines (illustrated talk about Carrie’s visit in 2016 to the Purple Community Fund). Learn more here. We hold PCF merchandise which they have creatively made from materials many would call rubbish, we can bring to sell afterwards – to raise vital funds for PCF. Inspirational upcycling in the garden. The Future We Want schools programme – either energy eco warriors or textile eco warriors. 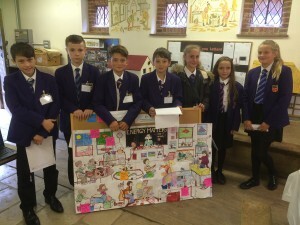 More subjects can be seen here. 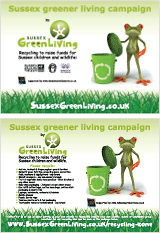 To book a talk, email cort@sussexgreenliving.co.uk or call 07768 212833. 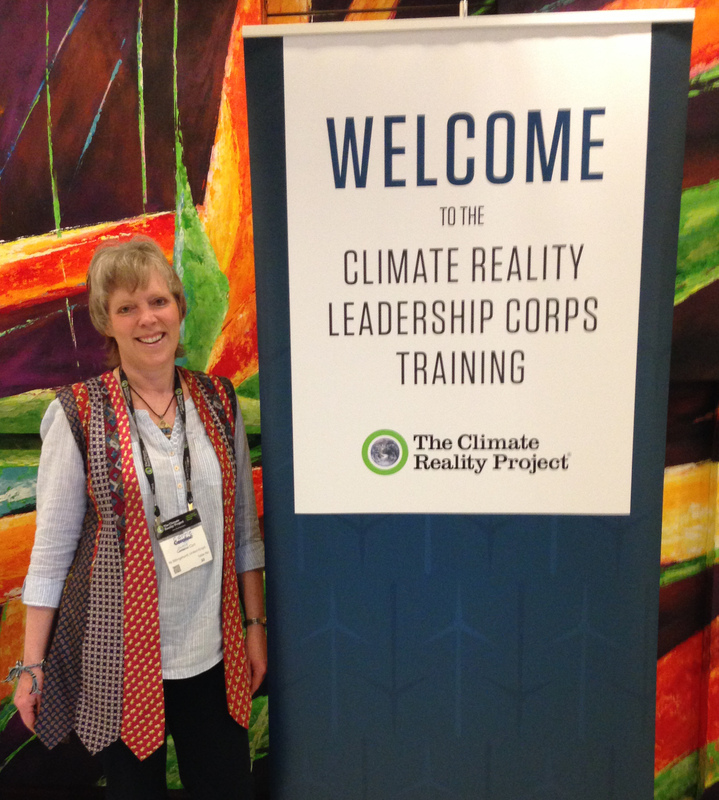 You can learn more about the Climate Reality Leadership Corp here. “Thank you for a most interesting Climate Reality talk, I learnt a huge amount and I’ve been speaking to family and friends about small changes they can make, such as who they bank with, meat free Mondays, etc. Thanks to you and Jenny for a great talk”. “Just a quick note to thank you for giving the Climate Reality Talk last night. It really was one of the best Transition Chichester evenings we’ve had for a while – and great to see so many people engaging with the topic. Good luck with all your ventures. I’m sure we’ll be working together again some time soon”. “Just to let you know that a lady came into our Your Community Energy Shop in Worthing yesterday for training as an energy shop adviser because she had been to your presentation on Sept 11th and signed a ‘pledge to the planet’. She wanted you to know she has honoured that pledge by changing energy supplier to a renewable one and is now learning to help others do the same”.